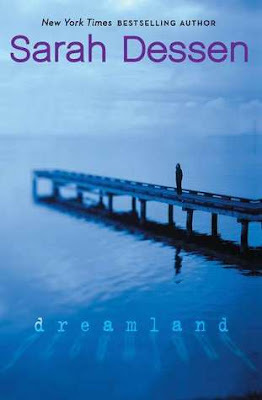 Dreamland by Sarah Dessen was the first book of Sarah’s I’ve read. Though some might find this weird, one of my favorite tropes to read are dysfunctional couples. I think that if written the right way, it’s just an easy thing to understand, or connect with. Or maybe its just me since I’ve been through my fair share of crazy relationships. Dreamland follows Caitlin, a high schooler who is pretty much ignored by her family when her older sister runs away from home. During this time is when she meets bad boy, Rogerson. Rogerson is all wrong for her, but being the young girl, she is, she doesn’t take the obvious warning signs seriously. The drinking, drugs, selling drugs. None of that really matters to Caitlin. Maybe it was because her homelife was falling apart, or maybe it was because she felt like Rogerson was the first person to pay her any attention, but Caitlin starts falling for him, and nothing can stop her from the path of destruction that she is on. I have to admit, when I saw this book I was really interested. I wasn’t sure what to expect, or where the relationship was heading. My whole problem with this book was that for the content, I was just not emotionally invested. The writing just didn’t have that emotional pull on me, the way books of this trope usually do. I was just reading and not feeling. And given the subject matter, I really wished I had felt more. It wasn’t until about 85% that I finally was emotionally invested, and that is the ONLY reason this book is getting a 3. I mean, the writing was decent, but for me it was lacking emotions. When I read a book, I want to not only read an amazingly, well written book. I want to FEEL everything while I read it. I want to feel like I’m right there, beside the characters as they’re going through whatever it is they’re going through. And unfortunately, Dreamland just didn’t do that for me (well at least for the first 85%). I guess I was just expecting more.